The incredibly charming and amicable Miniature Schnauzer is regarded by many as one of THE most adorable dogs to be around. Having a lot to do with their incredible loyalty and pleasant nature, this likable pupster makes for an ideal pet for any household due their sweet-nature and intelligent personality. The Miniature Schnauzer will certainly remain unreservedly loyal and dependable to his master making an excellent companion and a key member of the family. So what kind of food is best to feed your loyal Schnauzer? We take a look at some of the key foods for optimum nutrition whether you’ve just adopted a Miniature Schnauzer puppy and want to start them off on the right diet, seeking an alternative for your adult Schnauzer dog or adjusting nutrition for your older but much wiser Schnauzer friend. If you’re in a hurry check out Blue Buffalo Life Protection Formula Natural Adult Small Breed Dry Dog Food, Lamb & Brown Rice to help keep your Schnauzer in optimum health. It's made in the USA, uses premium high quality ingredients, is rich in vitamins and fatty acids all working towards improving the condition of your dog's skin and coat and maintain optimum weight. Luckily, Schnauzers are a healthy breed to begin with, so you shouldn’t have to look too hard for a premium dog food brand that will suit their needs. Schnauzers should be fed a diet that includes healthy and lean animal protein along with fruits and vegetables to provide them with complete nutrition so they can thrive and lead a healthy, long and happy life. Dogs generally rely on animal protein for promoting healthy and strong bones and muscles. So, hence we like to see foods where meat is listed as the primary ingredient, this is a good indication of the quality of food. The more meat sources that are being listed in the top five ingredients, the higher the quality. Some foods use grains as protein sources, so if there are more grains listed in the top five ingredients, they rely on plant protein as opposed to animal protein which we don’t really like to see. Given their coat requirements, miniature Schnauzers also need healthy fats as part of their daily diet to maintain and promote healthy and shiny coats. In dog food, we see this in the form of Fish oil, Chicken, Beef or Pork Fat, or Canola Oil. Fish oil is not only a great source of protein and healthy fats, it also provides the “essential” fatty acids such as omega-3 and omega-6 which is crucial for your dog’s health. It plays a key role in regulating their immune system, lowering blood pressure and improving cognitive function in older pets. So don’t shy away from feeding your Schnauzer with dry kibble that contains fish oil. If your dog is allergic to fish than you will have to seek other foods for the Omega 3 fatty acids or a supplement. Despite their reputation, not all carbs are bad and your Schnauzer will need carbohydrates in their diet. As a macro-nutrient, they provide energy, are a good source of dietary fiber which aims to promote gastrointestinal health. Saying that you would like to see a limited use of carbohydrates of roughly between 30% to 50%. Higher quality carb sources are oats, sweet potatoes, peas and barley. Avoid feeding your miniature Schnauzer with lower quality carb sources such as: grain-by products, starch or gluten. Regardless which breed dog you have, whether it is a standard Schnauzer or a Miniature Schnauzer or any other type breed for that matter, the key thing to take away is to find foods that provide the most health benefits to your pet. A high-quality feed which is high in protein, low in fats and limited carbs is a good measure to go by. Schnauzers are an active breed that might need to be fed a little bit more to meet their energy requirements. Schnauzers can be fed twice a day (once in the morning and once in the evening). You should pay as much attention to the quality of your dog’s snacks as you do to their food. Owners also need to be flexible since puppies eat more than adult dogs, and older dogs eat less than adult dogs. Here’s a quick estimated guide to the caloric requirements depending on your Miniature Schnauzer’s age, weight and activity levels. An active Adult Schnauzer weighing 15 lbs. requires 480 Kcal/day. A six month old Schnauzer puppy weighing 5 lbs. requires 550-650 Kcal/day. A less active, ​senior dog weighing 15 lbs. requires 380 Kcal/day. ***As every dog is different and the above are just estimated guidelines for this type of breed, please talk to your vet before making any changes to your Schnauzer’s diet. Blue Buffalo Life Protection Small Breed Adult Lamb & Brown Rice Recipe offers a formula specially designed to meet the needs of small breed dogs. This recipe is made with more protein and carbohydrates to support the high energy levels of little dogs, making sure that they stay happy, healthy and playful for their owners. BLUE believes that dogs should be fed like family, which is why their dog food is made in the USA using only the best ingredients. 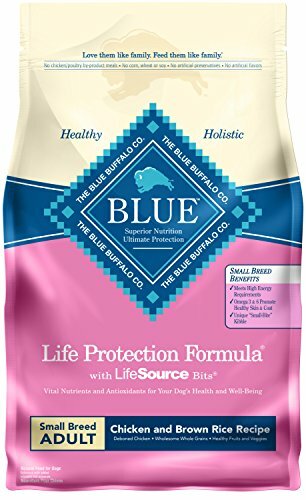 Each bag of Blue Buffalo Life Protection contains BLUE’s exclusive LifeSource Bits, a precise blend of nutrients to take care of dog’s complete health. LifeSource bits have now been enhanced with Blue Buffalo’s Super 7 package of antioxidant rich ingredients that maintain dogs’ healthy immune systems. Some of the main ingredients in Blue Buffalo Life Protection for small dogs are deboned lamb, fish, brown rice, oatmeal, peas, carrots, blueberries, and flaxseed. All quality ingredients and a perfect blend of quality protein derived from lean meat sources, high-quality carbs, fresh vegetables and fruit to help keep your Schnauzer in optimum health. I have used Blue Buffalo for years for my dogs because their dry dog food uses real ingredients and my dogs do well on it. It’s an ideal choice of affordable but quality dog food for Miniature Schnauzers which will help improve the condition of their skin and coat, maintain optimum weight, and aid in digestion. What stands out about this brand over other dog food manufacturers is that Honest Kitchen’s mission is to provide the minimally processed dog food to help seal nutrition in and the risk of toxins out so the integrity of the ingredients is not compromised. Dehydrated dog food gives your pet all the nutritional benefits of a raw diet without cooking. 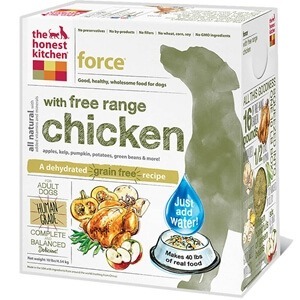 Their ​blend with Free Range Chicken is a grain-free variety and particularly great for Schnauzers with sensitivities. The first five ingredients are: chicken, organic flaxseed, potatoes, celery, sweet potatoes. It also has a very impressive blend of fruit and veggies in addition to vitamins and minerals making this a truly potent dog food. As the formula isn’t focused on protein but on overall nutrition (meats, essential carbs, fruit and veg) it provides a balanced diet with the perfect protein source and some excellent added super-healthy legumes, fruit and vegetables. To prepare the food all you have to do is to add water. It’s really that simple. On the negative side, it is a pricier dog option but you’re guaranteed premium nutrition. Bear in mind that a 4 lb. box actually makes 16 cups worth of food so that take into consideration when buying. 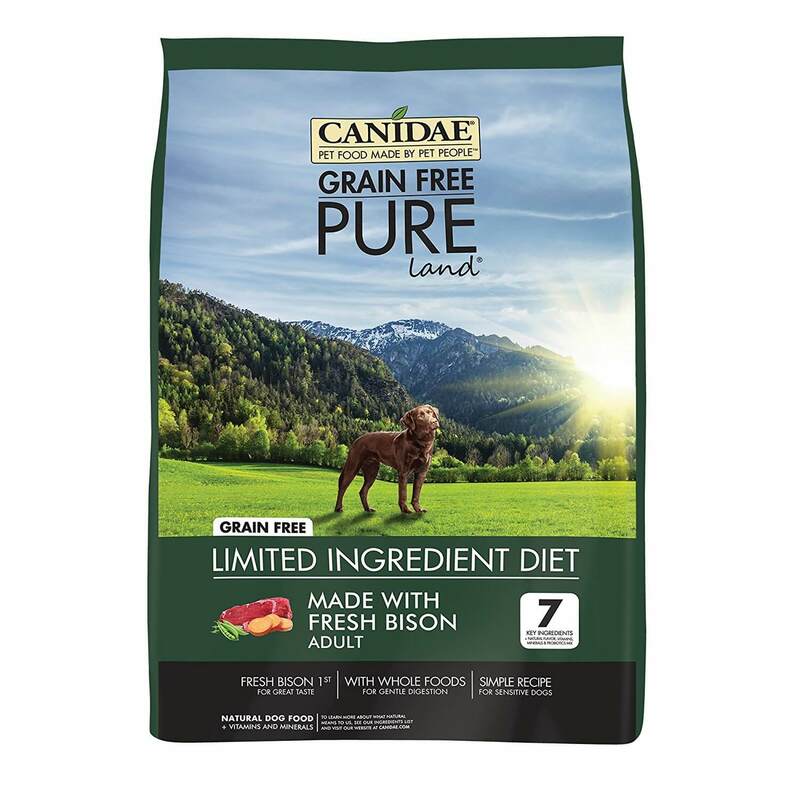 CANIDAE Grain Free PURE Dry Dog Food is a Limited Ingredient Diet formula that focuses on seven key ingredients, so owners know exactly what they are feeding their dogs. Limited Ingredient Diets are great for dogs who need to be careful about their weight or have allergies and sensitivities to other dog foods. Fresh bison is the first ingredient and this recipe’s main source of flavorful protein. Since CANIDAE uses healthy, whole ingredients in its dry dog food, this brand is known for being easier on dogs’ digestion. This recipe’s main ingredients are fresh bison, lamb meal, sweet potatoes, pea, chickpeas, and canola oil. CANIDAE Grain Free PURE also contains a mix of vitamins, minerals, and probiotics to support dog’s complete health. Like most premium dog foods, CANIDAE includes antioxidants for a healthy immune system and Omega fatty acids to promote skin and coat health. Picky dogs or dogs with allergies and sensitive stomachs love this food. Owners say that their dogs’ digestion is healthier after switching this brand and even find their breath smells better! By age 8 your Miniature Schnauzer may start to show signs of aging and now would be a good time to adjust their feeding and food brand. As they become less active, the likelihood of putting on weight also increases so you want to start cutting down their caloric intake and change to a food brand that is low in calories, offers quality protein and is limited in carbs. 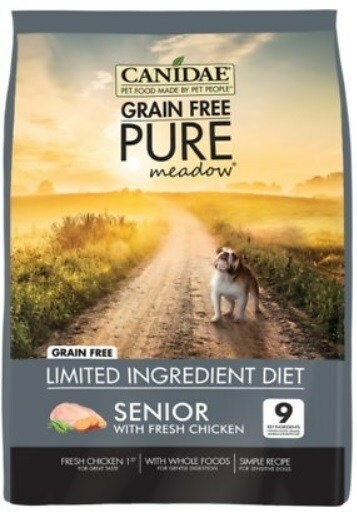 The CANIDAE Grain-Free PURE Meadow Senior Formula with Chicken Limited Ingredient Diet Dry Dog Food is one of the best dog foods to feed your senior Miniature Schnauzer. This formula is high in quality protein derived from chicken, chicken meal and turkey meal. If your senior Schnauzer has serious food allergies, this recipe contains only 7 to 10 key ingredients that are nutritious and a healthy choice. It's also blended to include lots of fruit and vegetables which provides all the required vitamins and minerals an older dog requires to maintain optimum health. This kibble has low-glycemic limited carbs and contains glucosamine and chondroitin which will help sustain your dog’s bones and joints in good health. It has only 409 Kcals/cup and is made up of 28% crude protein, 39% carbohydrates and 10% crude fat which is impressive to see in a dog food. Canidae Grain Free Pure is a food we like and believe it offers a complete diet of virtually every nutrient your Miniature Schnauzer needs to thrive. Small breed puppies require a higher energy requirement than their adult or older counterpart. To ensure your Miniature Schnauzer puppy grows into a healthy dog, seek out a feed that is dense in protein with adequate fats, high in calories but with limited carbs. 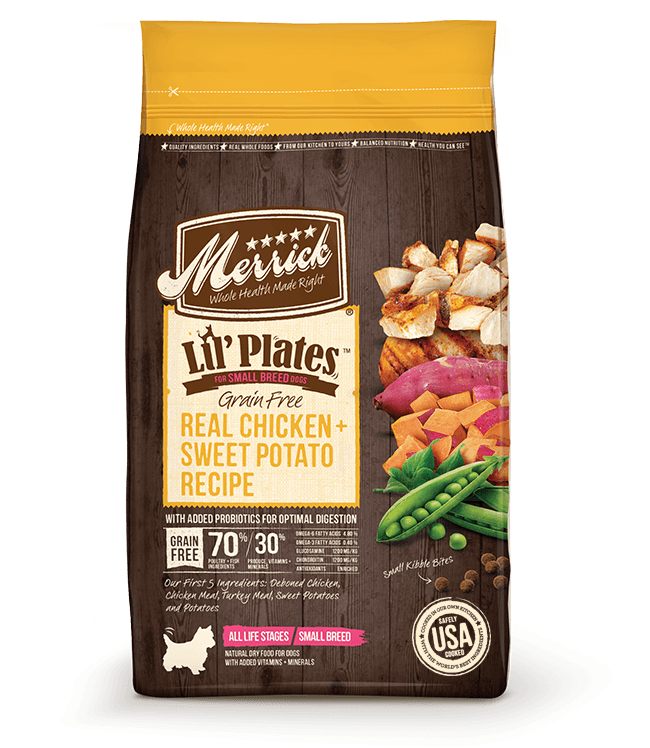 Merrick Lil Plates Grain-Free Chicken and Sweet Potatoes is an all life-stages blend we like since it offers the best nutrition diet for a growing small breed pup such as the Miniature Schnauzer. Using deboned chicken as its primary ingredient followed by chicken meal, turkey meal and sweet potatoes it is easy to see why we have selected this food. First three ingredients are meat sources which are also lean protein meats. The small bite sized kibble is also another feature we like. It’s great for dogs that have sensitive stomachs and since pups are in their growing stage this blend is also packed with amino acids and fortified with vitamins and minerals. At 430 Kcals/cup and dry matter figures of 43% protein, 19% fat and estimated 29% carbs it is easy to see why we rank this brand as the top puppy food for a Miniature Schnauzer. *** As always, seek advice from your Veterinarian before adding any ﻿supplements ﻿or changing your dog's diet.